Add a functional work of art to your living room, dining room or bedroom with an Antep Rugs Kashan King Collection area rug. This elegant and versatile floor rug features a classic color combination that blends in elegantly with a wide array of color schemes and home furnishings. The beautifully detailed pattern adds texture, warmth and dimension to your space while remaining subtle enough to complement rather than compete with the rest of the décor. With a moderate pile height of 0.3 inches, this fashionable indoor area rug is soft and inviting underfoot without becoming bulky or difficult to vacuum. The versatile area rug size provides ample coverage to protect flooring from the scratches and minor damages that can come from foot traffic and furniture. Placed beneath a coffee table in a living room or next to a bed in a bedroom, these classic floor rugs help to define the look of a room while keeping it warm and inviting. This low-maintenance Antep Rugs Kashan King area rug is a practical way to enhance the look of high-traffic areas such as entranceways and family rooms. Designed for durability and good looks, this indoor area rug is made in Turkey to the highest standards of quality. Each rug is machine-crafted with strong and stylish 100% Polypropylene materials that can stand up to regular wear and tear with style. Simply by vacuuming regularly and spot cleaning as necessary, you can easily maintain this practical stain-resistant material for years of enjoyment in your home. FASHIONABLE FLOOR RUG: This versatile Kashan King collection area rug features a stylish color scheme and a bold, eye-catching pattern that will effortlessly complement any décor. VERSATILE GOOD LOOKS: Add a fashionable complement to a living room, dining room or bedroom with this versatile indoor area rug. With its classic color scheme and practical size, this area rug makes an attractive addition to any décor. DURABLE COMFORT: Machine-made from stain-resistant and stylish 100% Polypropylene, this durable area rug is designed for comfort and style. With a pile height of 0.3", this floor rug offers cushioned comfort without being too bulky. LOW-MAINTENANCE FLOOR RUG: Strong Polypropylene materials will stand up to regular wear and tear for years of stylish comfort. This durable indoor area rug can be easily maintained with regular vacuuming and spot cleaning as needed. DEDICATED TO QUALITY: Antep Rugs manufactures and imports high-quality area rugs from Turkey. A growing name in the home-fashion world, Antep Rugs produces an impressive range of colorful floor rugs designed to complement any room like a work of art. If you have any questions about this product by Antep Rugs, contact us by completing and submitting the form below. If you are looking for a specif part number, please include it with your message. 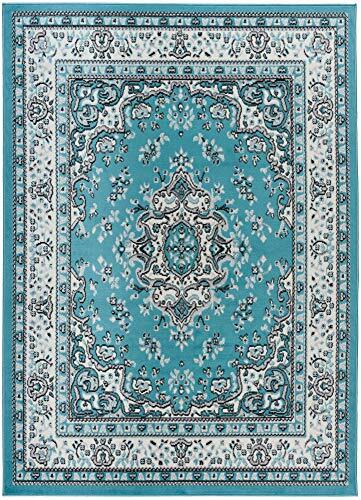 Collections Leaf Pattern Decorative Indoor Area Accent Rug, Blue, 27" X 45"